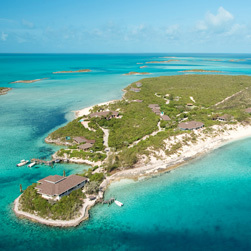 Fowl Cay is among the 300 tiny islands that make-up the secluded and sublime chain known as the Exumas in The Bahamas. Today, Fowl Cay Resort is a private island with a very special difference: six uniquely beautiful villas spread across 50 acres. Here, guests may rent a villa or the entire island and everything, from a fully stocked fridge and cupboards, to all meals, premium alcoholic and soft drinks to a personal motor boat with unlimited gas – is included. Casual luxury defines life on the Cay.